If your not familier with the music creating tool, the Theremin, take a jump over to Wikipedia for the full story. Basically, it is an electronic device with two antennas. It produces music depending on where you hands are relative to the antennas. Many classic bands and modern movies have used the tool. Now, we can get a similar effect with our iPad. 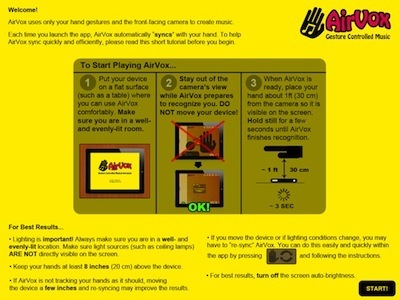 Instead of antennas though, AirVox on your iPad2 makes music by seeing your hands with it’s camera. This universal app needs a camera on the screen side so it works on the iPad2, iPhone4 and newest Touch. When you launch AirVox, it will take a few seconds to recognize the ambient light, then your ready to rock your music. Sure, it’s a lot of fun to make and record interesting little tunes, but we are anxious to see what the real musicians on our team can create. Does it work? Yes, AirVox really does do a pretty good job at recognizing the movements of your hand(s) to create music. At first, we were hitting ‘C6’ a lot which got to be an irritating tone… but that is our fault. Once we got the hang of it, some faster than others, fun little tunes were coming out. The better folks in the office where actually mimicking music we knew. 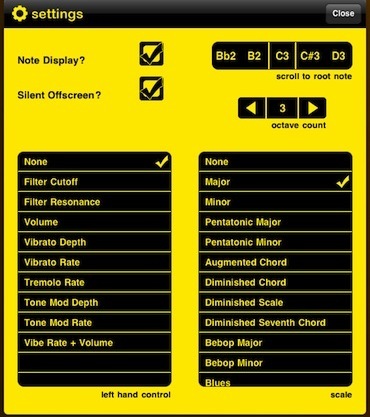 AirVox has 50 musical scales, each with settable root note and octave range. 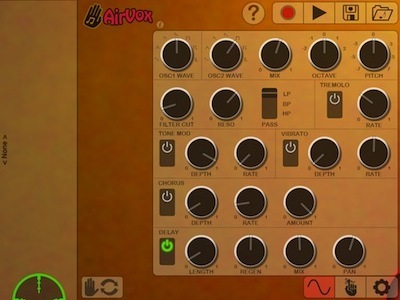 AirVox has a complete sound engine, made of dual oscillators, many waveforms, musical filters and audio FX, including vibrato, delay, and tremolo. AirVox has 48 built-in presets. Tweak knobs and save any number of your own. If you choose to record your AirVox creations, they appear in a folder list so you can have more than just the last done. 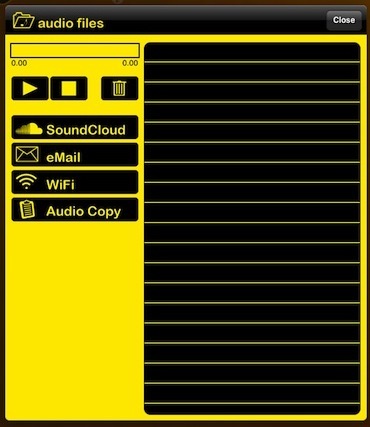 Tap one to play or to choose how to share through ‘SoundCloud’, Twitter and Facebook, email or back to your computer.